​The EdgeStar IP210TI ice maker is popular thanks to the affordable price and quality build. In this EdgeStar ice maker review, we will go through the description of this machine, its technical specs, and pros & cons. We will also go through some ice maker reviews from verified customers to make sure the information we provided is accurate and also provide our verdict on the EdgeStar IP210TI ice maker. ​This EdgeStar ice maker is 14 inches tall, 11.8 inches wide, and 14.5 inches long, so it will fit great almost anywhere around the house. It has a titanium finish which makes it sturdy and adds a sleek look. Weighing 31 pounds, it is easy to carry from place to place: from your kitchen to your outdoor pool or in your RV. It is well built, which guarantees a lasting ice maker in your house. The display of this ice maker is rather simple. With just a couple of buttons and display lights, it does its job fairly well. The control panel allows you to turn it on or off and set the desired ice size while also letting you know when the appliance needs more water or when you need to empty the ice bin. The EdgeStar ice maker has a simple control panel: a couple of buttons through which you can choose the size of the ice cubes (small, medium, and large) and an on/off button. The last two indicator lights warn you when the ice bin is full or when you need to add water. Installing the ice maker is fairly simple: you just plug it in, add water, and after ten minutes you can enjoy your first batch of ice. It requires no drain, so you can add either tap or bottled water. Just as mentioned in the specs, the ice bin cn hold 2.5 pounds of ice at a time; after producing this much, the ice maker will stop until some or all of the ice is removed. Although it doesn’t have an insulated ice bin, the EdgeStar IP210TI has a recycling function that allows it to reuse the water resulting from meted off ice cubes. Note: This product is also featured on our list of the best compact ice makers! If it isn’t exactly what you were looking for, make sure you check it out! ​Titanium finishing, which makes it scratch-resistant. ​Compact and portable, you can take it with you everywhere you go. ​Storage bin that can withhold 2.5 pounds of ice. ​Makes ice in only 10 minutes. ​The ice bin is removable. ​It consumes 310W of power. ​Lacks a digital display with more convenient features. ​It doesn’t have a self-cleaning option. ​The ice sensor is a bit flaky and lets the machine make too many cubes sometimes. ​Difficult to see the water level as the ice basked comes on top. 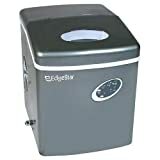 John says that he very much likes this EdgeStar ice maker and mentions that if you use filtered water, the ice cubes are tasteless. The bad side is that you have to manually fill the EdgeStar ice maker. Nevertheless, his family virtually loves this ice making machine. Another user was unlucky. After a couple of months, the ice maker started making small ice cubes. Although his unit had coverage under the warranty and the company helped the customer with the issues he had, he is displeased with his investment. He does not recommend this ice making machine to other people. The third user, RickMan, comes from a family of campers and is very satisfied with this EdgeStar ice maker. Although they were a bit worried by some of the negative reviews posted, decided to buy it. They put a gallon of water and leave it running. They mention that they do not have any problems with the ice maker. There is no perfect recipe for the perfect, unbreakable, not too costly, yet not too cheap ice maker. But the EdgeStar ice maker with its titanium finish and solid construction is sure to last and to keep on offering high-quality ice. With three size choices, fast ice making, compact size and lightweight build, this is a safe bet. If you’ve owned an EdgeStar ice maker, please share with us your opinions and impressions. If you have questions or comments, share them with us in the comments section. And don’t forget to subscribe to our newsletter for more ice making reviews and top-tens.